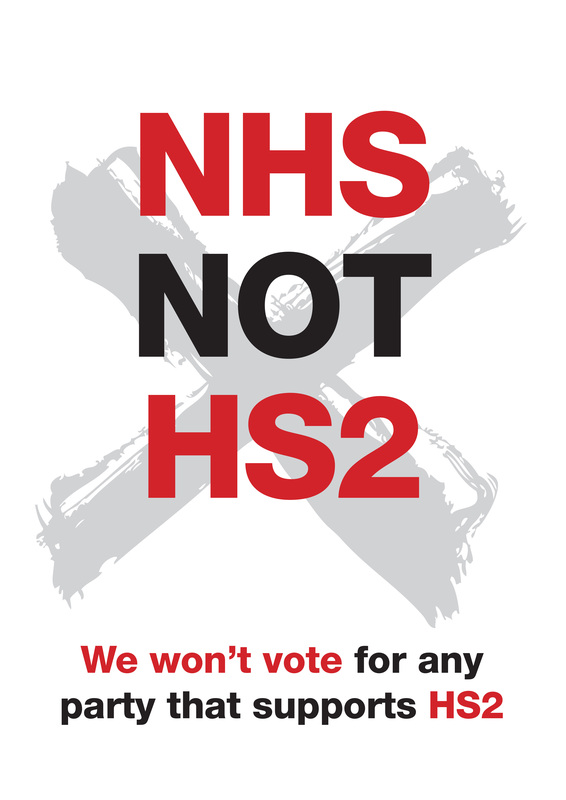 STOP HS2 | Campaigners forced to break law to continue HS2 fight in election run-up. 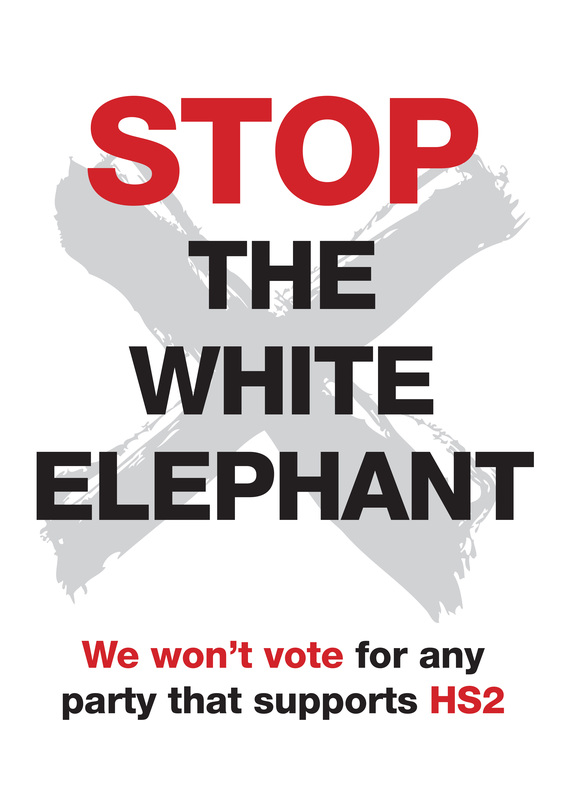 To mark the fifth anniversary of the original announcement of HS2 by then Labour Minister Lord Adonis on 11th March, the Stop HS2 campaign has unveiled publicity for individuals and campaign action groups to use in the run-up to the election, which will fall foul of the Transparency of Lobbying, Non-Party Campaigning and Trade Union Administration Act 2014, also known as the ‘Gagging Act’. 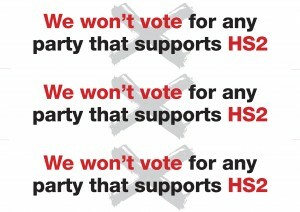 Stop HS2 has produced various designs of posters and window stickers with the common theme of “We won’t vote for any party that supports HS2”. 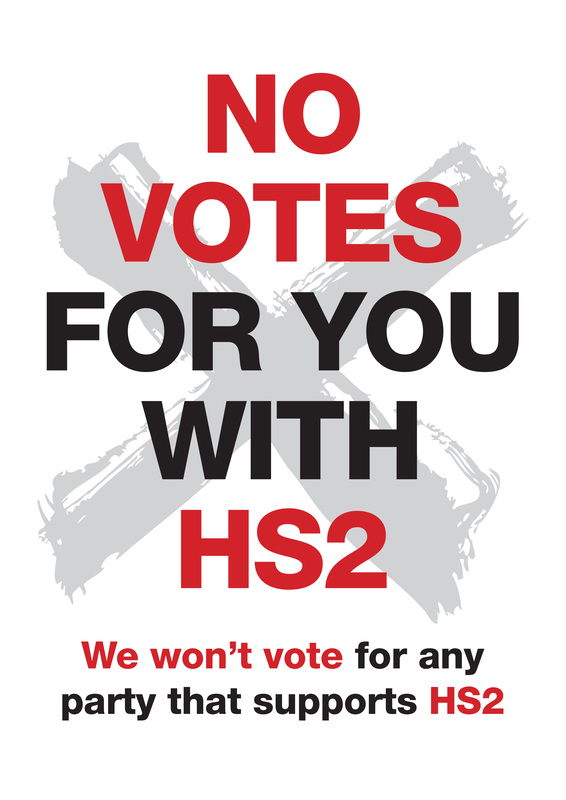 These are available from the Stop HS2 website to print off, or to buy as window stickers and correx boards for outdoor use. Under the provisions of the Gagging Act, organisations and individuals engaged in joint campaigns which have the same objective, such as over 100 local actions groups and other organisations working together to get HS2 cancelled, have to provide figures for expenditure which can be interpreted as intended to promote or procure electoral success at any relevant election for parties or candidates who hold (or do not hold) particular opinions or who advocate (or do not advocate) particular policies. Expenditure which qualifies includes the production or publication of election material such as: leaflets, adverts and websites, canvassing; or market research seeking views or information from, members of the public; press conferences and media events; transport of persons to any place or places with a view to publicising a campaign; and public rallies or other public events. 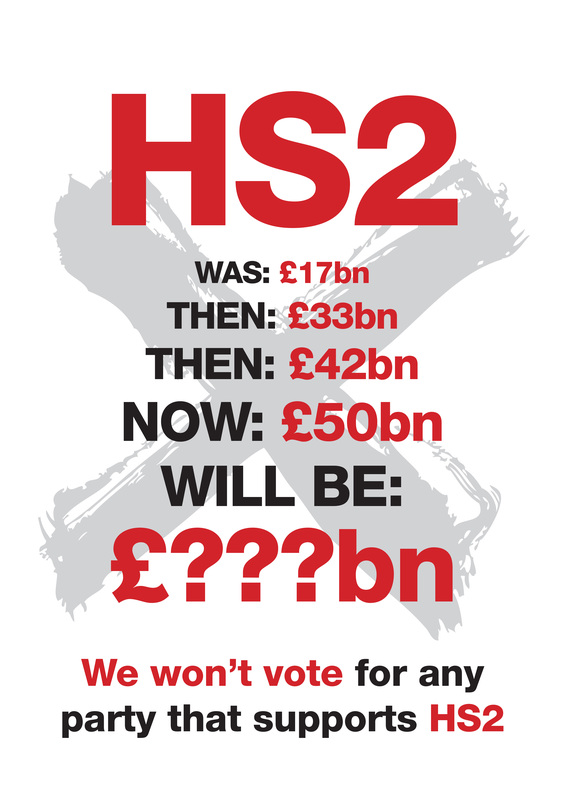 There is no question that continuing to campaign against HS2 in the run-up to the General Election will fall foul of this act, as whilst the three main Westminster parties support HS2, The Green Party, UKIP, Plaid Cymru and the NHA Party do not. As such, saying HS2 should be cancelled in the run up to the election will be interpreted as tacitly advocating voting for those parties. However, with so many small voluntary groups involved in the campaign, trying to determine what is regulated expenditure and collating it all within three months would be an impossible task. Not much Transparency of Lobbying in the behaviour of parites and whips when local interests are subsidary to party dogma which increases national debt and takes away land from more appropriate uses. Non-Party Campaigning but defence of your local rights particuarly when deserted by an incumbant MP and remote MP. Trade Unions did not support improving the route and service. No Public Planning inquiry or Public Inspectorate balanced Administration but dogmatic acts from the Coalition and no challenge from Labour. Time to Act in May 2015 and vote for your particular interests. The MP candidates have no rights to dictate what you cannot do and you have right to object to what current MPs have done in their interest or their party’s interests. IF Cameron cant handle three debatesd and screams about unfairness and Miliband requires his wifes support then you can tell these people sorry but you have not produced an acceptable benefit for my community. You have dictated ahead of Royal Assent of future local devistation for the community and have not produced sufficient mitigations. People vote alone and make their minds up from their feelings, beliefs and interests. HS2 is on their monds, feelings and impacts their beliefs and interests. MP candidates intend to promote or procure electoral success at any relevant election for parties or candidates who hold (or do not hold) particular opinions or who advocate (or do not advocate) particular policies. but your vote is your legitimate right to agree or disagree. Time has arrived to stop the squandering of the Second Billion of debt on such and incomplete and narrow rail service project which serve little local commuter purpose.